Gastric cancer (GC) affects nearly one million individuals every year, and most of them are from China, Japan, and Korea. It is the fifth most common malignant tumor worldwide and the third leading cause of malignant tumor mortality with more than 723,000 deaths . About 70–85% of individuals with GC die within 5 years of diagnosis, and the high mortality associated with GC is mainly a result of limited therapeutic methods and lacking of early diagnosis. Aggregation within families occurs in almost 10% of patients (5–30%), although most GCs are sporadic. Now we know that hereditary germline mutations lead to half of these familial cases [2, 3]. In regions where the incidence of GC is low, heritable pathogenic mutations, which leads to most familial cases, increase risk from birth. Truly hereditary cases, as some studies pointed out, account for 1–3% of the global burden of GC , and most of those are hereditary diffuse gastric cancer (HDGC). It is reported that, in about 40% of families affected by HDGC, the E-cadherin/CDH1 germline mutations can been found. It is very important to identify the inherited factors among patients with family histories of GC, in order to diagnose early and manage effectively. We usually use symptoms, such as different family individuals are diagnosed with cancer, the histological types are diffused adenocarcinoma, and the patients are young and with multiple cancer syndromes, to identify HDGC. Some cases of other hereditary tumor syndromes may also present GC, and thus the risk of GC should be taken into account in these patients. The hereditary cancer syndromes include the gastric adenocarcinoma and proximal polyposis of the stomach (GAPPS), familial intestinal gastric cancer (FIGC), Lynch syndrome (LS) caused by germline mutations in DNA mismatch repair genes and microsatellite instability, familial adenomatous polyposis (FAP) associated with germline APC mutations, MUTYH-associated polyposis (MAP) associated with MUTYH mutation, Peutz-Jeghers syndrome (PJS) caused by germline STK11 mutations , juvenile polyposis syndrome (JPS) associated with germline mutations in the BMPR1A and SMAD4 genes, hereditary breast-ovarian cancer syndromes (HBCS) related to germline mutations of BRCA1 and BRCA2, Li-Fraumeni syndrome (LFS) due to germline p53 mutations, and so on . Setia N, Clark JW, Duda DG, Hong TS, Kwak EL, Mullen JT, et al. Familial gastric cancers. Oncologist. 2015;20(12):1365–77. doi: 10.1634/theoncologist.2015-0205. Fitzgerald RC, Hardwick R, Huntsman D, Carneiro F, Guilford P, Blair V, et al. 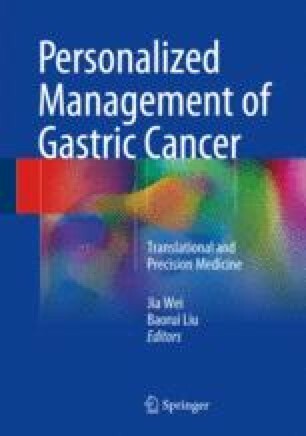 Hereditary diffuse gastric cancer: updated consensus guidelines for clinical management and directions for future research. J Med Genet. 2010;47(7):436–44. doi: 10.1136/jmg.2009.074237. Carneiro F. Hereditary gastric cancer. Pathologe. 2012;33(Suppl 2):231–4. doi: 10.1007/s00292-012-1677-6. Geary J, Sasieni P, Houlston R, Izatt L, Eeles R, Payne SJ, et al. Gene-related cancer spectrum in families with hereditary non-polyposis colorectal cancer (HNPCC). Fam Cancer. 2008;7(2):163–72. doi: 10.1007/s10689-007-9164-6. Boland CR, Koi M, Chang DK, Carethers JM. The biochemical basis of microsatellite instability and abnormal immunohistochemistry and clinical behavior in Lynch syndrome: from bench to bedside. Fam Cancer. 2008;7(1):41–52. doi: 10.1007/s10689-007-9145-9. Vasen HF, Moslein G, Alonso A, Aretz S, Bernstein I, Bertario L, et al. Guidelines for the clinical management of familial adenomatous polyposis (FAP). Gut. 2008;57(5):704–13. doi: 10.1136/gut.2007.136127.